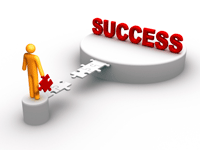 Handling the Fear of Success – The Inner Soul of Me! Fear of success can be just as paralyzing as fear of failure. Many people fear success because it tests their limits and makes them vulnerable to new situations. Even worse, success can expose weaknesses and force people to deal with their flaws. Success is scary because it involves change. Success can be intimidating and hard to handle. With success comes more challenges and responsibilities – and that can be threatening. Accept yourself as being healthy, “together,” happy, successful, prosperous and accomplished. Do not give yourself any excuses for being unsuccessful. Have honest, open, realistic self-talk that encourages you to work your hardest to achieve the goals that you have set for yourself. Accept the compliments and recognition of others with an open heart and mind. Begin to visualize and speak what success will look like in your life. Giving others credit, recognition, and support for their personal achievements, successes and accomplishments. Recognize and welcome the chance to triumph over competition without feeling unworthy or undeserving. What things are you putting in place for the new year to put fear in it’s place once and for all?